Jennifer Mills Art - Awards ceremony and performance text. Awards ceremony and performance text. I will try to serve god and my country. Help people at all times, and live by the scout's law. What the scout's law is, I cannot say. Even though I cannot say what it is I promise to live by. This unknown scout's law is important to me! Oh the things it must say! Oh how it must read! Would surely dictate my actions and deeds! 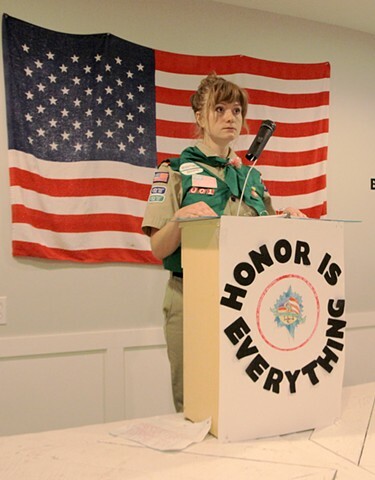 And ask "What did the Scouting Law Actually Say?"